In order to tell this story as it must be told, we need the resources to take time not only to write, but to hopefully travel to do interviews and other research. 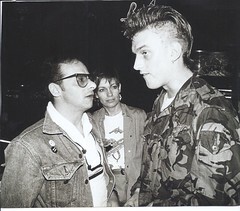 For example, we hope to go to the UK to retrace the footsteps of The Clash’s final tour, the extraordinary “busking tour” of May 1985, talking to folks who saw the band at the time, thus helping to bring this powerful piece of The Clash story back to life. In addition, we are incurring on-going expenses paying for postage, phone bills, copying, as well as photos and other materials we will want for the book. We also need to augment the funding Akashic Books is able to give to the project, in order to produce and promote the finished book as it deserves. Finally, we need your participation in ways that go beyond money; we also want your memories of seeing The Clash in their last two years, as well as photos, fliers, and beyond for possible use in the book. Thanks so much for any help you can give—we can’t do it without you! 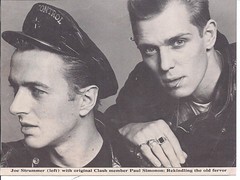 A custom “We Are The Clash” thank you postcard, with rare busking tour photo, signed by both authors! Besides the WATC thank you card, Chairman Ralph will design three punk collage postcards with a message of your choosing, and send them to you. You get the WATC thank you card, the 3 collage postcards, plus a custom acoustic/electric punk song by Chairman Ralph, recorded direct to disc, about any Clash Mark II-related theme or issue of your choice. A personalized “thank you” directly in the book’s credits. A free copy of the book, as well as personalized “thanks” in the book. A copy of the book signed by one of the authors (your choice), together with a personalized thanks. A free copy of the book, signed by both Ralph and Mark, as well as a personalized thanks directly in the book’s credits. A limited edition “We Are The Clash” jumbo 2′ x 3′ poster, together with signed book and personalized thanks in the book’s credits. A personally crafted mix CD of some of the best songs The Clash did live 1984-85, as well as the poster, signed book, and personalized thanks. Mark will treat (and accompany) you to the DC-area punk show of your choice, together with mix CD, poster, signed book, and personalized thanks. Mark will host a vegan candlelight dinner for you and yours at his DC home, with wife, son and cats (as well as all the other gifts) OR Ralph will play his solo versions of Cut The Crap’s 12 songs live, or via the magic of cellphone, speakerphone, or Skype and provide a CD of that material, with between-song commentary… together with all the other gifts!